Special thanks to our amazing customers who continue to help us grow! 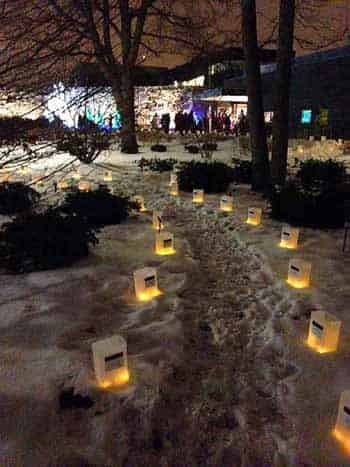 "We used our new luminaries over our commencement weekend and loved them. I want to put them all over now!" "Hello, just thought I would take a minute to tell you that we are very satisfied with our Flic Luminaries. We bought 24 of them to line our walk and driveway for the holidays this year. I installed RGB LED pixels in them and you can see the results in the photos. It took a little doing to get the color just right and program in a flicker with LOR S3 software but I think we did OK. During the holiday season, we will program them to be different colors to give the display a little variety and interest. What you can't see under the gravel are four 1/4" holes that I drilled into the bottom of them to let rainwater drain out. The night we put them out we got almost 2 inches of cold, freezing rain and they held up just fine. (new luminaries have 4 punch-out holes on the bottom. No need to drill!" They turn heads as people drive through the neighborhood. We are very pleased and will probably buy more for next year and put them out for all kinds of parties and celebrations. Not just Christmas. We highly recommend them to anyone looking for a durable and flexible luminary solution." "I was planning a December wedding in Kansas. It could be snowing, raining, freezing drizzle, or even a tornado! My daughter wanted me to make paper luminaries but I knew I couldn't take the chance of going through all the trouble of making velum luminaries then have the weather destroy them in a few minutes to a few hours. I found FLIC Luminaries online and I am happy with the results at the end of our wedding event! The pictures are absolutely beautiful! 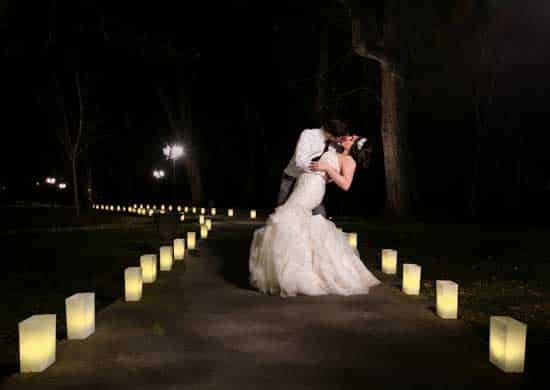 We even added out door wedding sparklers with the luminaries and the pictures are gorgeous! I look forward to using the weather proof luminaries in the future for many events. Thank you FLIC Luminaries!" 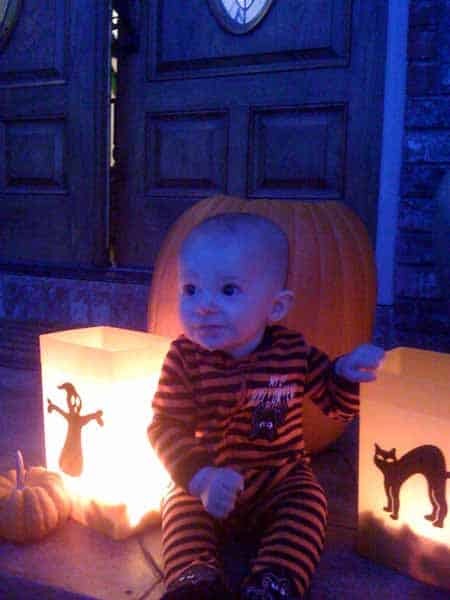 "Just wanted to say how much I love these Halloween luminarias. I had been wanting something to line my long driveway and walkway with for a long time. I was looking for something festive but not too scary for the little trick-or-treaters, and I didn't want the traditional paper sacks or candles for several reasons. After searching the web, I bought yours a few weeks ago and used them tonight and they were a huge hit with the neighbors. I received so many compliments on them. They were so easy to set up and take down. Hopefully next year, with no hurricane to stop me, I'll be able to enjoy them a week or so before the big night." "Received the luminaries. They are GREAT!! Thank you for the wonderful service." "Thank you. The Catering Manager just received the package and said they will be beautiful at the River Cabin area. Thank you for your expedited response in handling this order. We look forward to do additional business with you in the near future. Have a great weekend!" "Hi everyone! I had emailed on Tuesday having just discovered your luminaries online...I had asked for a Friday delivery-you tried to deliver on Thursday but I didn't get your call in time-I received them on Friday in time for our big Xmas party on Saturday. They are beautiful! Just beautiful! Everyone loved them and they were the hit! I have given your web site to more than 5 people from our party so hopefully it results in more business for you! I am a business owner and good service is hard to find. Outstanding service even more difficult...thank you so much for YOUR outstanding service! I am thrilled!!! Thank you again! Happy Holidays to you all!" "Good riddance to paper bag luminaries. In 2001 and 2002 our neighborhood luminary display was completely ruined by sleet and wind. After hours of preparation and lighting we were wiped out by mother nature. After using the FLIC Luminaries last year I will never use any other. There was little preparation time. They were not affected by the weather and clean up consisted of stacking them for storage. This year I won't even have to do the sand weighting as I stored them without emptying the sand." "When I discovered FLIC Luminaries, I realized there is a solution for easy placement on my adobe wall. The frustrations of attaching (then re-attaching) other luminarias to my wall are over. With the simple addition of some weight, the FLIC Luminaries, with the Adobe Wall Mount, have clung tenaciously to my wall through some strong winds. At Christmas time I leave my display up for several weeks. When I found that I could stack these luminarias for storage, leaving the lights attached, I was sold." "I am always looking for creative ways to turn a party into a fiesta. The FLIC Luminaries allowed me to do just that. They are easy to set out, seem to burn forever, and are easy to pick up. The way they "glow" from the candle's light is just incredible." "Thanks for inventing your luminaries. As president of the College Hill Neighborhood Association, it's my job to try to get as many of our members as possible to participate in decorating their homes with luminaries for our annual trolley tour. Previously, the usual paper bag luminaries have been ruined by rain and sleet. Your new product was extremely timely, as again we had bad weather, but the display remained fail proof. 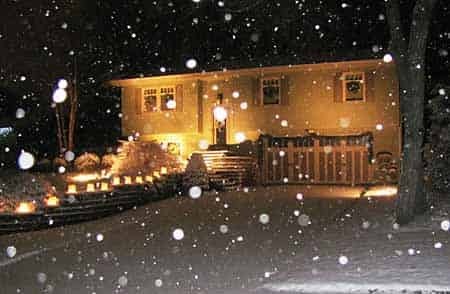 At a meeting after our Christmas event, the College Hill residents who had used the FLIC Luminaries had positive reactions." "A friend told me about your luminaries just in time for the wedding I was planning for my daughter in Puerto Aventuras in Mexico. We arranged them on the beach and they glowed throughout our wedding. My husband said they were easy to install. He used the stakes to hold them down, and the wind shields to block the strong ocean breeze. They were absolutely beautiful. Thank you." 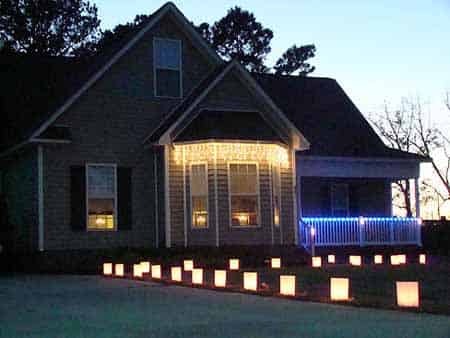 "I just used my luminaries for the second time, and I can't imagine how I ever managed to put out the old paper sacks. I picked up the stacks of luminaries from the garage and set them out and that was it. About 10 minutes total time. I used the old candles and the sand was already in the luminaries. It was great. Now I have light strings coming from FLIC and I can't wait. That will be easier still. I'm going to use the red, white and blue bulbs that you suggested and put them out on the 4th of July. Thanks for making my life simpler."